Several structures over the course of history have been built, destroyed and rebuilt all over again. But would you believe me if I told you that there is one particular structure that had experienced that same cycle eight times? The Manila Cathedral before the earthquake of 1880. The Manila Metropolitan Cathedral-Basilica aka Cathedral-Basilica of the Immaculate Concepcion or more commonly known as the Manila Cathedral is the central church of the Roman Catholic Archdiocese of Manila which means the cathedra (bishop's throne) is housed here. Located in front of Plaza Roma, the cathedral is an imposing sight. On the right of the cathedral is the Ayuntamiento and on its left is the former Palacio del Gobernador, the two symbols of power in Spanish colonial Philippines. 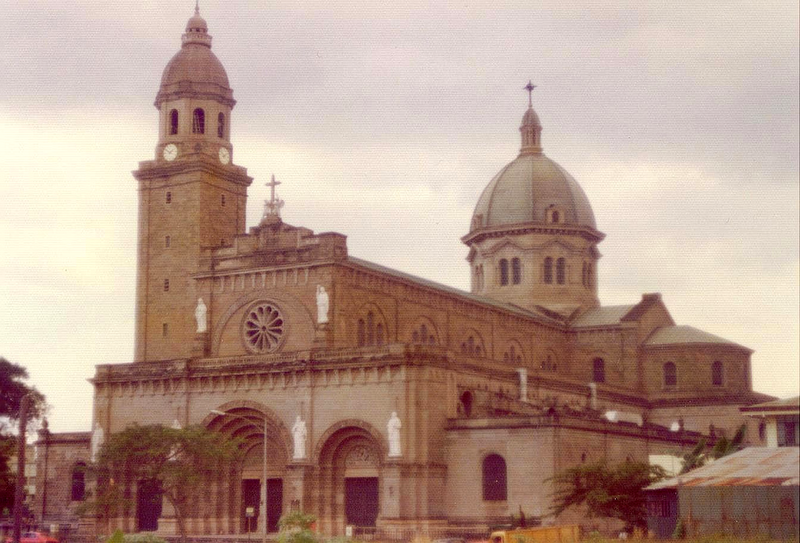 Through the papal bull, the Manila Cathedral was declared a minor basilica by Blessed Pope John Paul II in 1981 So what is the difference between a cathedral and a basilica? Read here. 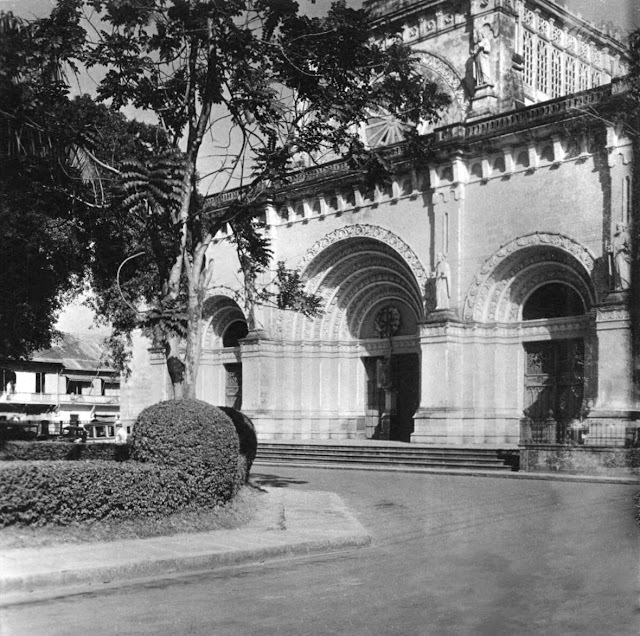 The cathedral was originally named the Church of Manila in 1571. Miguel Lopez de Legazpi personally selected the land where the church will stand and was placed under the patronage of Sta. Potenciana. In 1581, a royal decree ordered that a cathedral was to be built for the newly colonized city. In 1581, the first cathedral made of nipa, wood and bamboo materials was completed. The weak materials were very prone to fire and because of this, fire completely razed the church to the ground in 1583. In 1592, the second cathedral made of stone was built but was destroyed again by an earthquake in 1600. The third cathedral was completed in 1614 but was destroyed by another earthquake in 1645. Illustration of the fifth cathedral which was inspired by the Il Gesu in Rome. 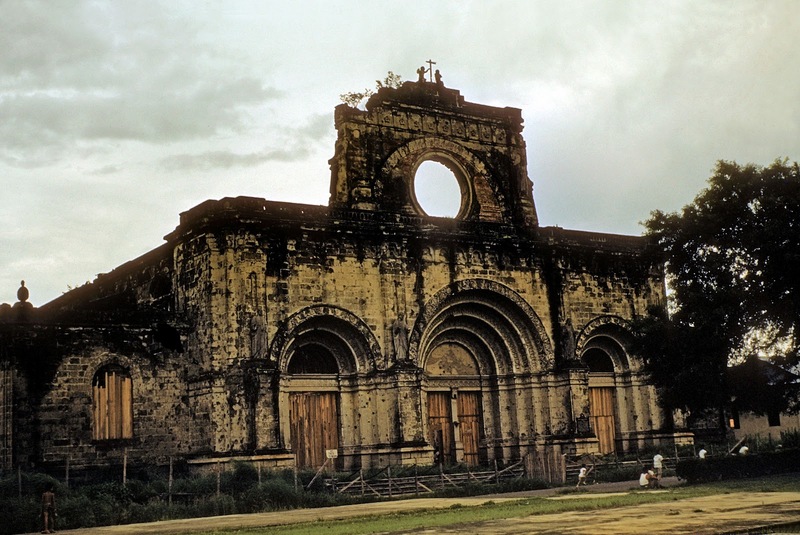 The construction of the splendid fourth cathedral began in 1654 and was completed in 1662 under Archbishop Poblete. 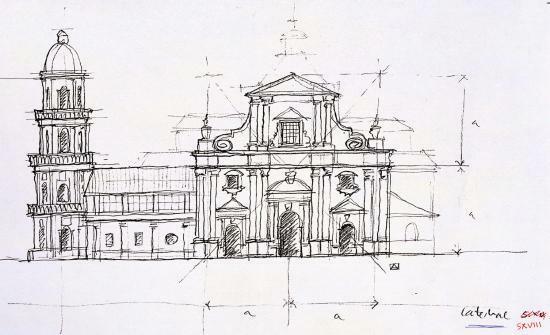 In 1760, under the supervision of Florentine architect Fray Juan de Uguccioni, the new fifth cathedral was conceived. It was reconstructed and the new facade was patterned after the Il Gesu in Rome. Fifth cathedral, 1790. The Plaza Mayor was not yet developed. The fifth cathedral showing Plaza Mayor with the statue of King Carlos IV, Ayuntamiento on the left and Palacio del Gobernador on the right, circa early 1800s. The Neoclassical sixth cathedral, signed by Arch. Vicente Serrano. 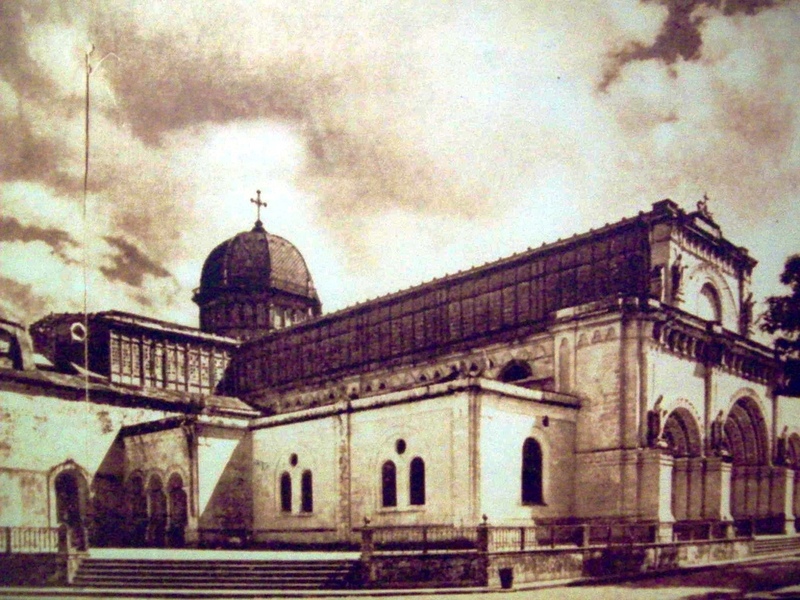 The sixth cathedral, probably during construction. 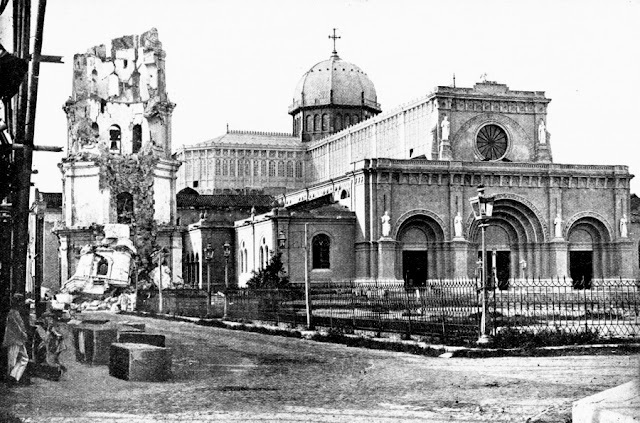 The fifth cathedral was extremely damaged during the 1852 earthquake that rocked the city. 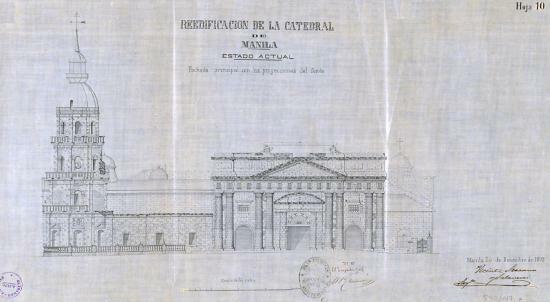 Plans for the reconstruction of the sixth cathedral commenced and the new cathedral formally opened in 1858. Uguccioni's Baroque facade was replaced by a new Neoclassical one. 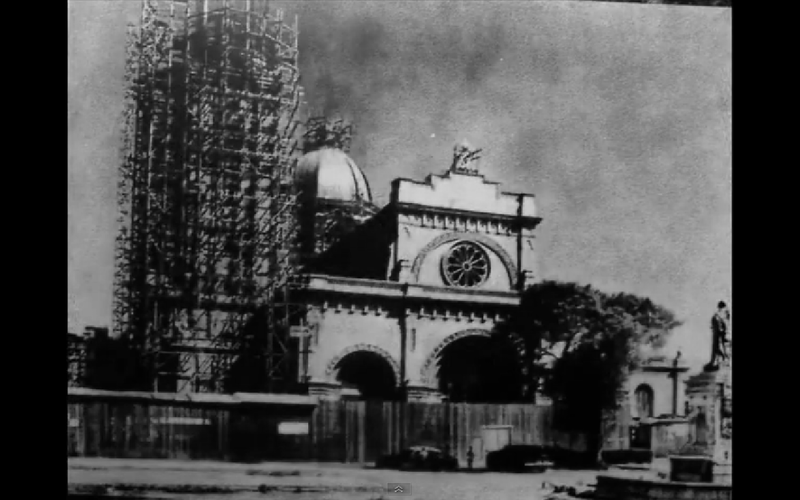 The cathedral's dome was also replaced. From Uguccioni's box-like cupola, it was replaced by a circular one. The sixth cathedral was destroyed by another catastrophic earthquake in 1863 but the bell tower survived. The ruins of the church were cleared and plans for a new cathedral visualized. The seventh cathedral with the bell tower still standing. 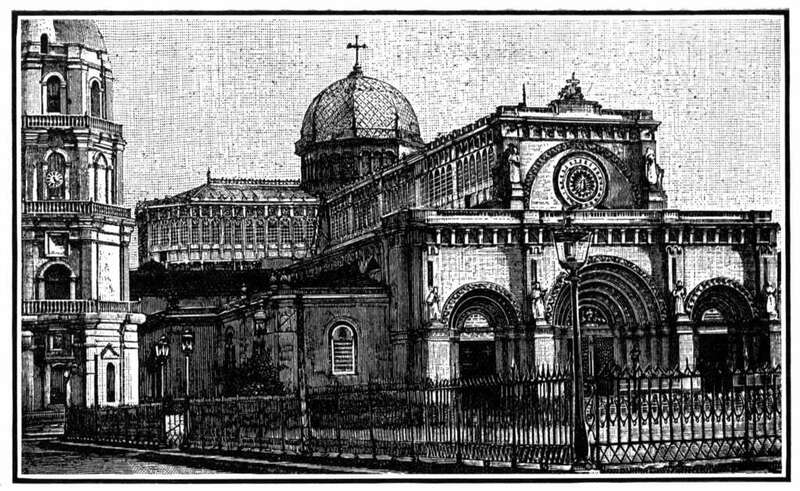 Another illustration of the seventh cathedral showing the Neo-Romanesque facade. 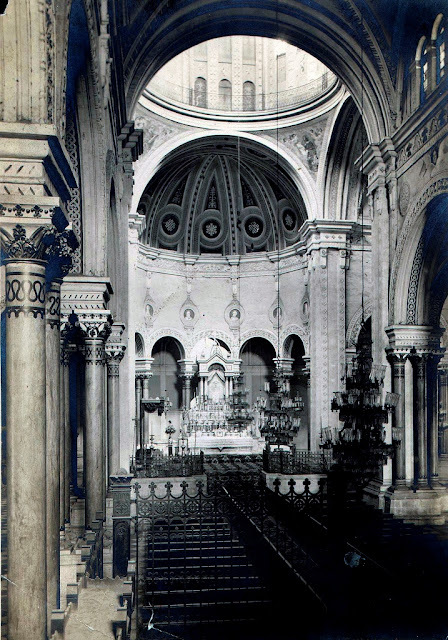 The cathedral's beautiful pre-war interiors. 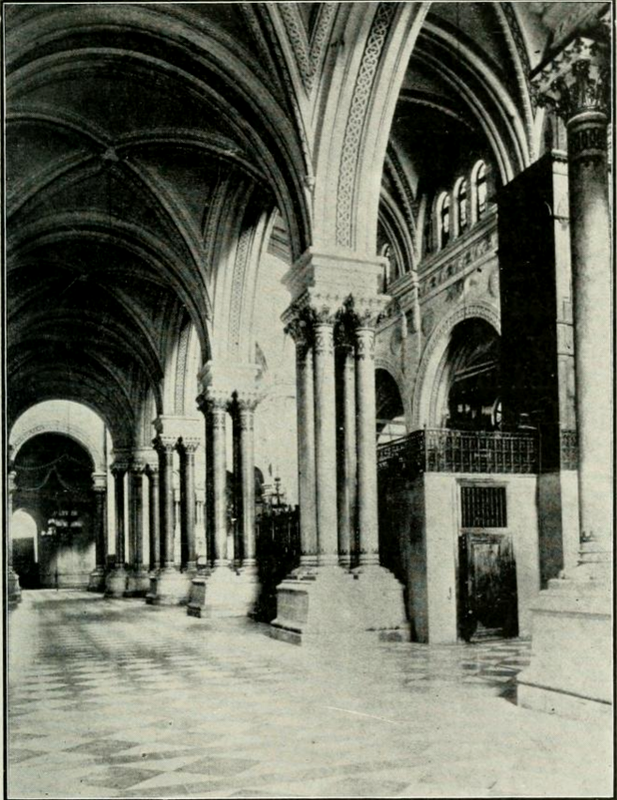 Pre-war interior showing the beautifully adorned columns and ceiling of the cathedral. The cathedral's retablo mayor. Compared to the other retablos of other Intramuros' churches, the cathedral had a simpler one. The seventh cathedral headed by Arch. Serrano followed the Neo-Romanesque/Byzantine style with an oriental mix. 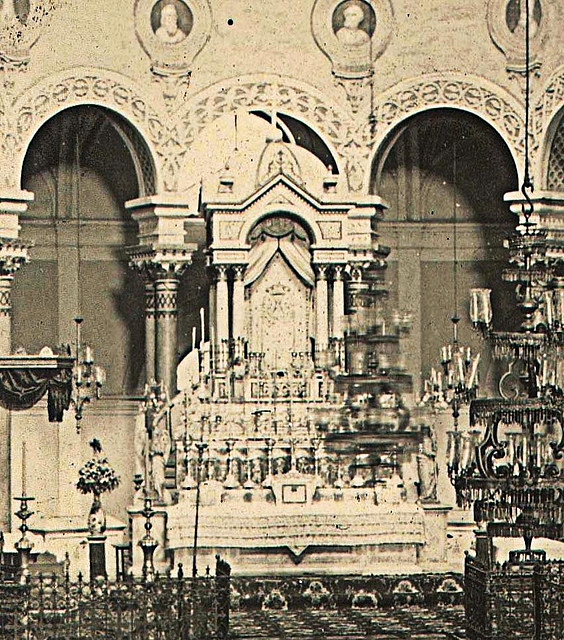 The church's interior was richly ornamented, sculptures and frescoes embellished every space. Renowned Filipino sculptor, Isabelo Tampinco, also did some work there. The cross atop the central dome of the cathedral was the reference point of astronomical longitudes of the archipelago, the kilometer zero. The damaged bell tower and the unscathed church. 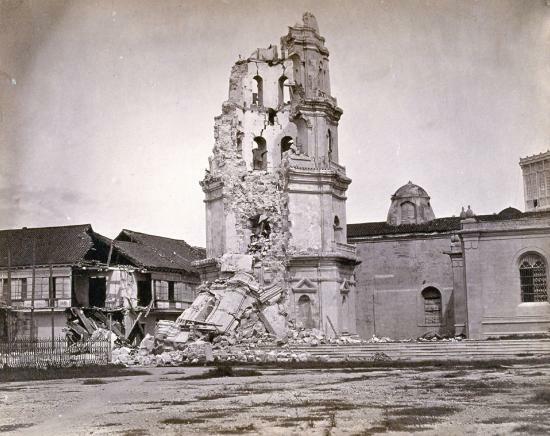 The damaged bell tower after the 1880 earthquake. 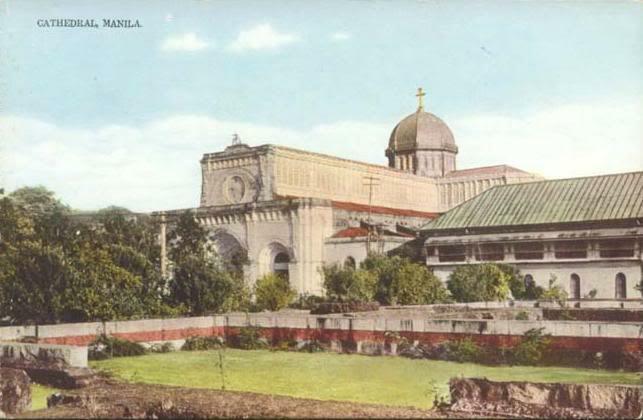 A vintage colored postcard showing the cathedral from the ruins of the old Palacio del Gobernador. Another strong earthquake rocked the city in 1880. The bell tower which survived the 1863 earthquake, crumbled to the ground. The cathedral however, survived. This was the same earthquake that destroyed the left tower of San Agustin Church and the nearby Palacio del Gobernador. There was also a proposal for two twin towers for the cathedral but this was never executed. 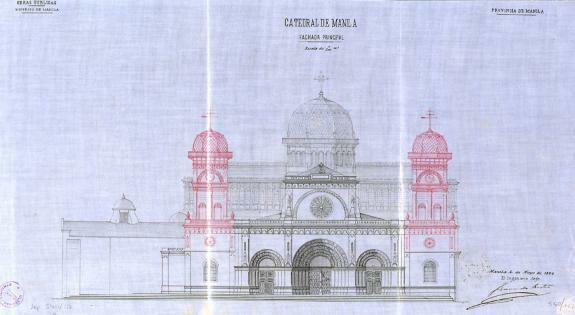 Project for the construction of two twin towers for the Manila Cathedral, 1894. Plans for the tower's rebuilding surfaced but one tragic event made the restoration completely unattainable. It changed the fate of the Manila Cathedral and all the other structures in the city. 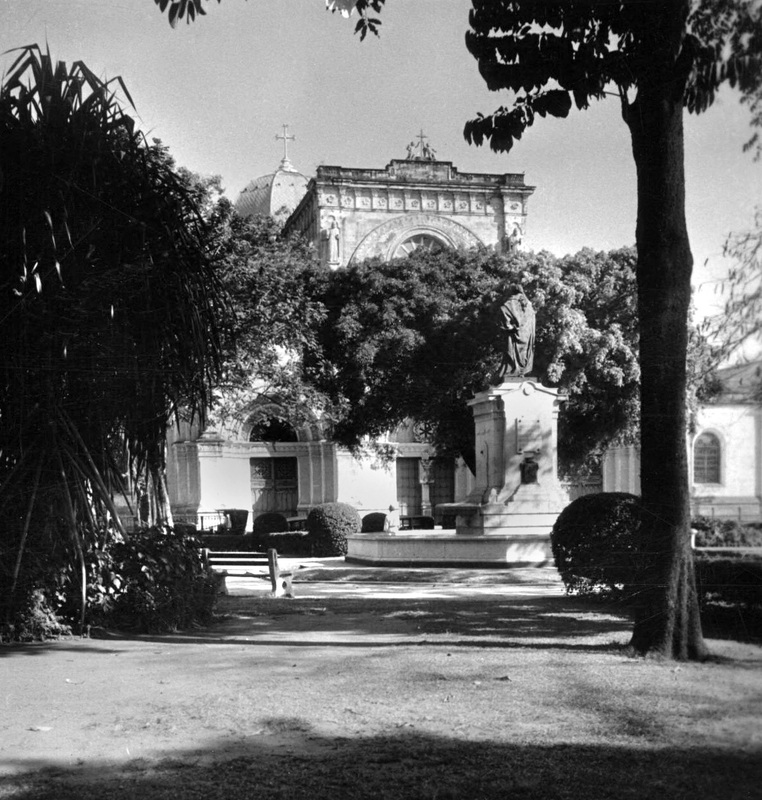 View from the ruins of the Palacio del Gobernador, c1890s to 1900s. 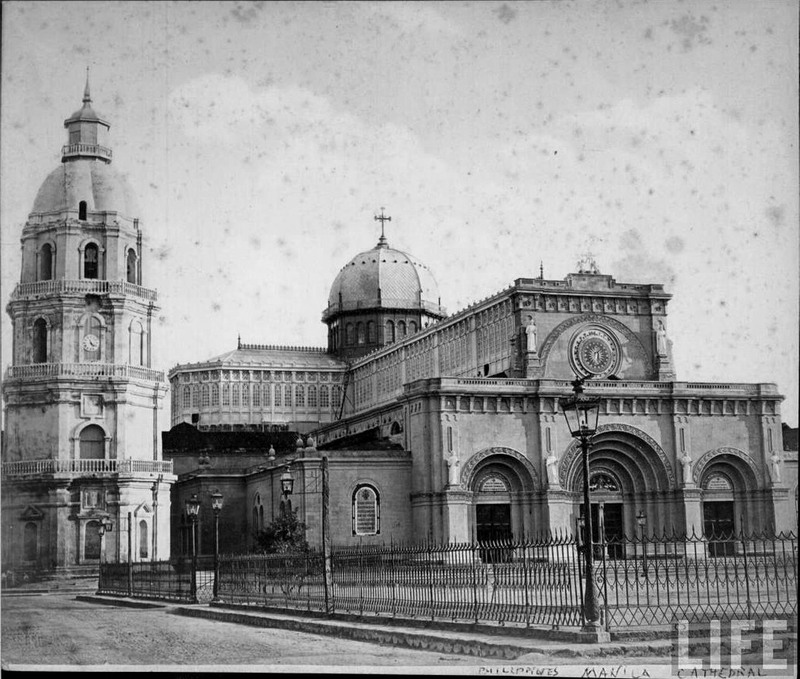 Pre-war Manila Cathedral, c1890s to 1930s. 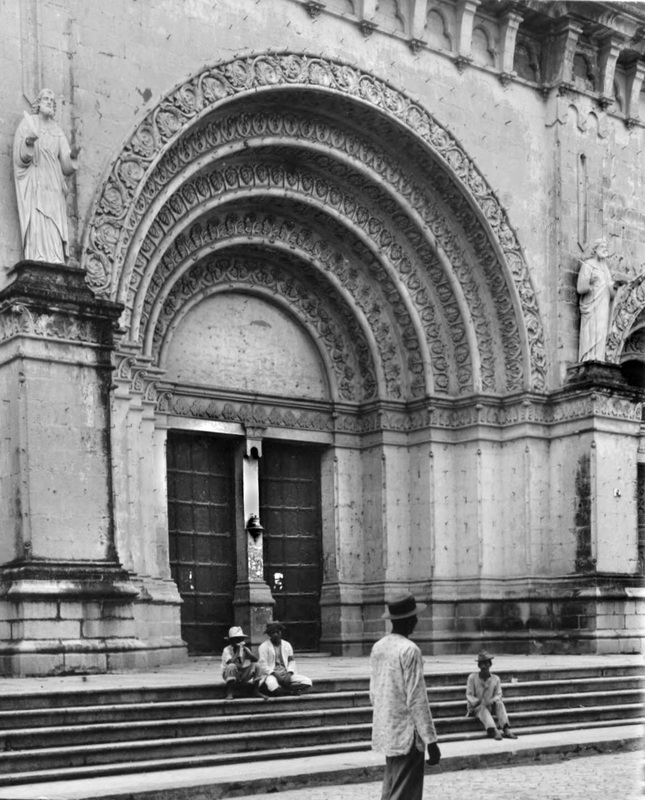 The cathedral's central entrance portal, c1890s to 1930s. 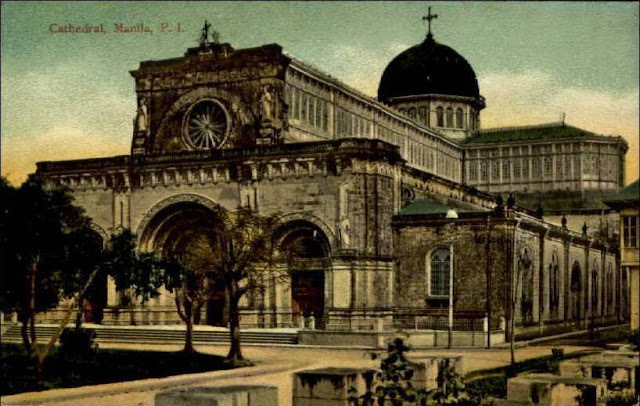 The view of the cathedral from Plaza Mayor, c1890s to 1930s. 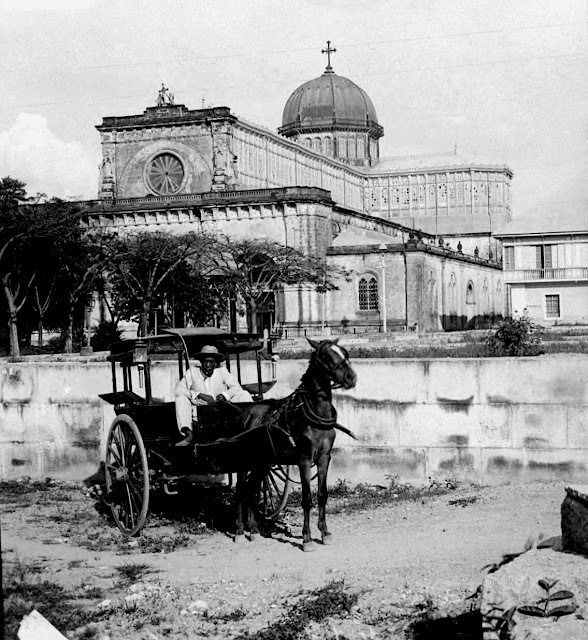 A calesa and the Manila Cathedral, 1900s to 1930s. Another view of the cathedral showing the old site of the bell tower that's already been cleared. 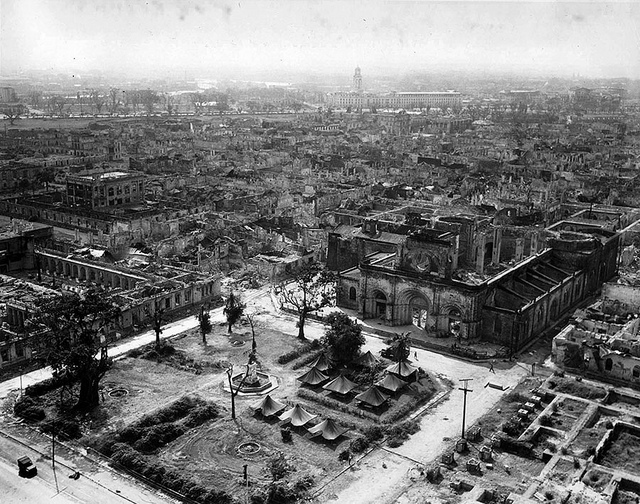 World War II broke out and completely destroyed the cathedral. Only the ruins of the facade survived. 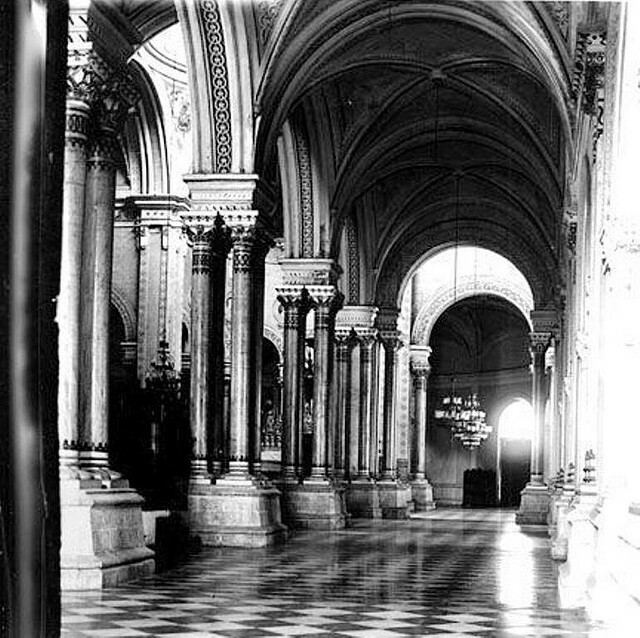 Unlike all the different churches in Intramuros, the Manila Cathedral was rebuilt from 1954 to 1958 headed by Arch. Fernando Ocampo. 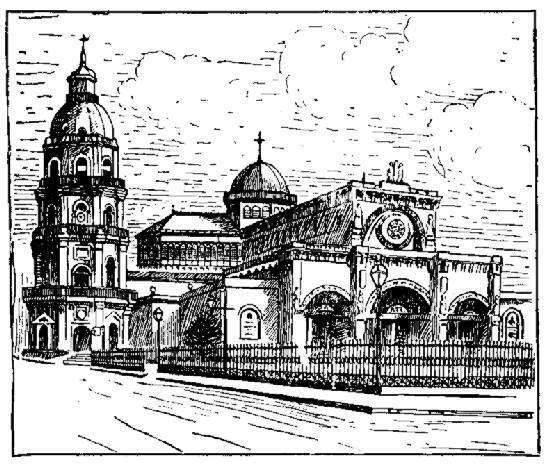 He retained the Neo-Romanesque facade adding a slender, quadrilateral bell tower near the church. 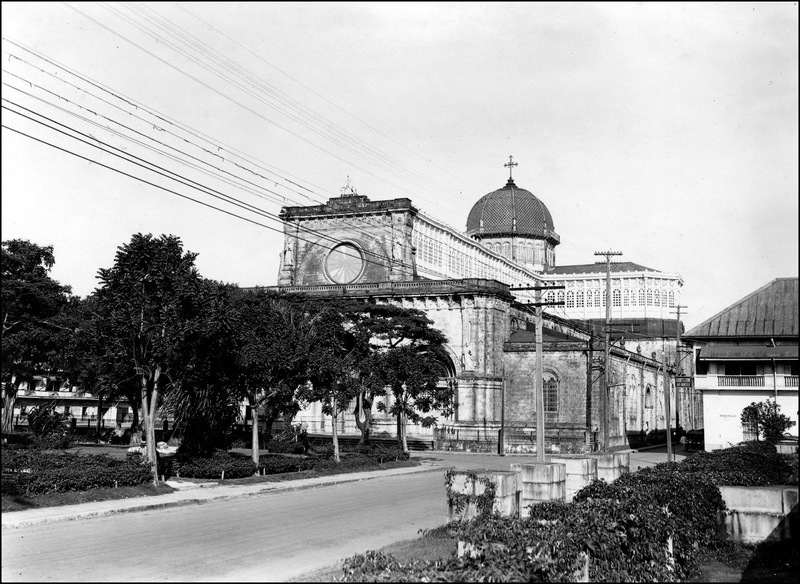 Fortunately, the Manila Cathedral still exists today. The devastation brought by war pulverized the centuries-old Intramuros. 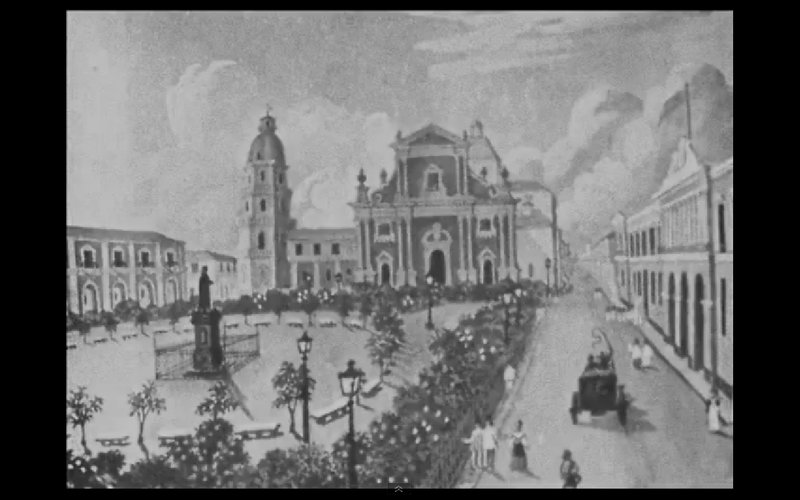 You can see the ruins of the Ayuntamiento on the left and the ruins of the Manila Cathedral on the right. Manila City Hall's clock tower as seen at a distance. Remains of the Manila Cathedral after the Liberation of Manila, 1945. 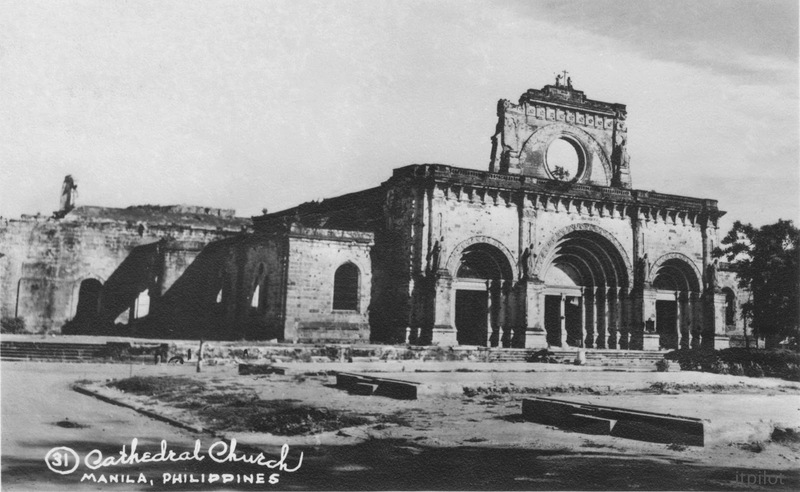 Ruins of the cathedral, late 1940s. 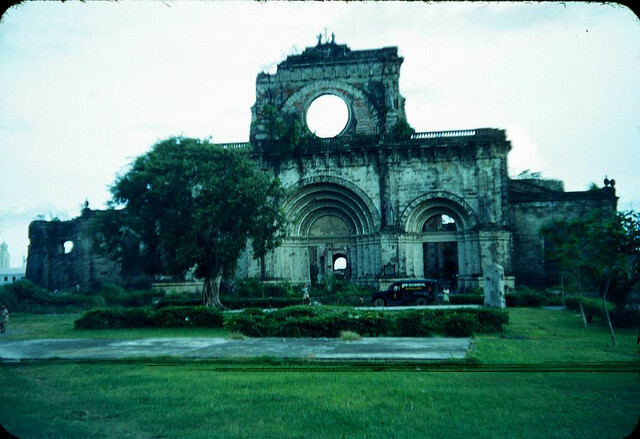 Ruins of the cathedral, circa late 1940s to early 1950s. 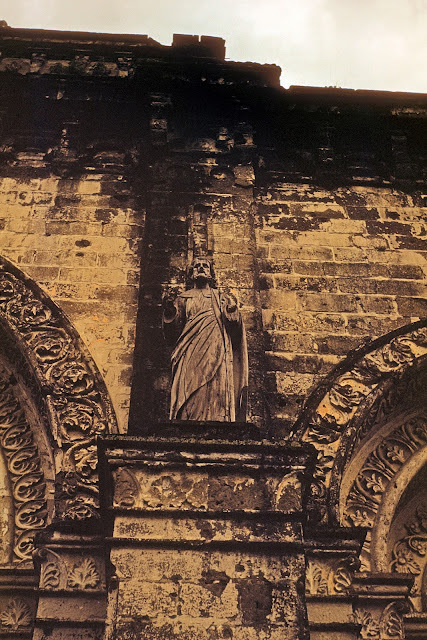 You can still see the amazing sculptures and carvings on the cathedral's front facade, late 1940s to early 1950s. 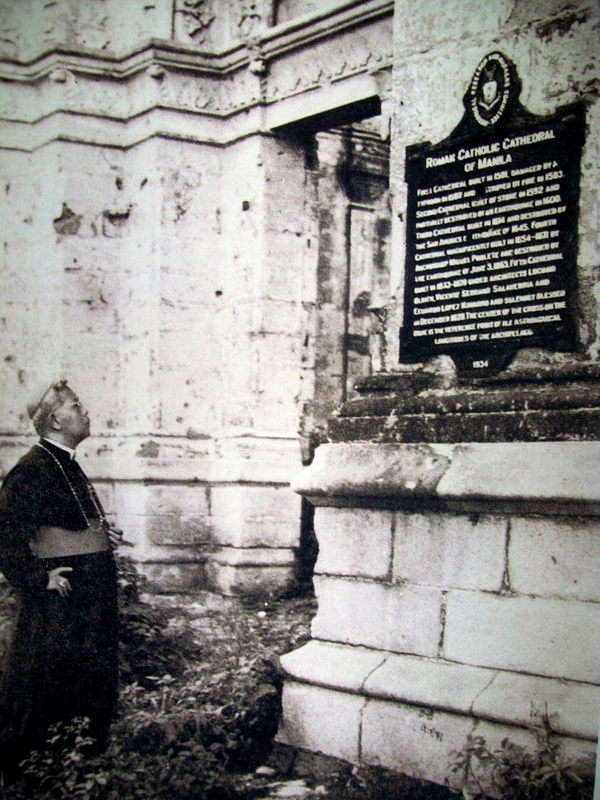 Amidst the ruins, first Filipino archbishop Rufino Santos reads the historic pre-war plaque installed by the Historical Research and Markers Committee, dated 1934. The Manila Cathedral is very historical indeed. 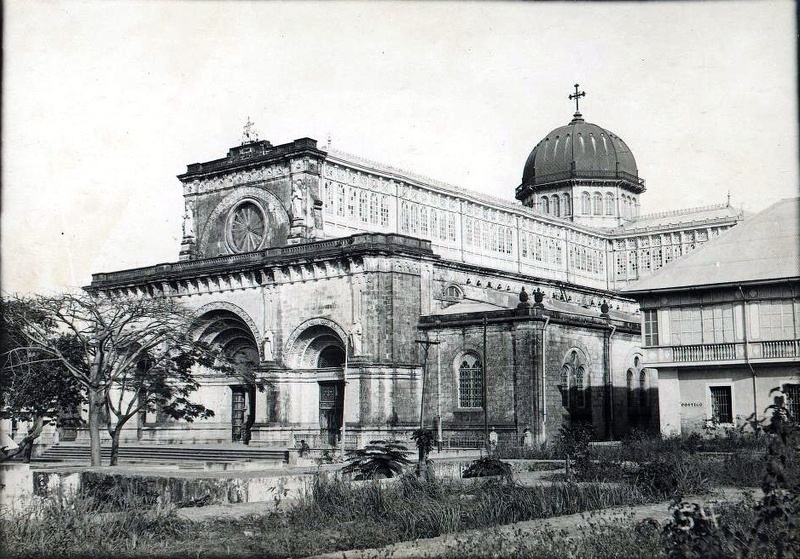 It was rebuilt 8 times, it was once a Baroque church then it became a Neoclassical one then a Neo-Romanesque one, it was completely destroyed during the Liberation of Manila but rose back up again. From its humble beginnings, it grew and metamorphorsed to this glorious symbol of Filipino Catholicism, a monument of our religious heritage. Construction of the eighth cathedral, 1952-1954. Post-war Manila Cathedral, 1973-1975. This is the church that we see today. Do you have photos of San Agustin Church? this post was so amazing. Thanks! 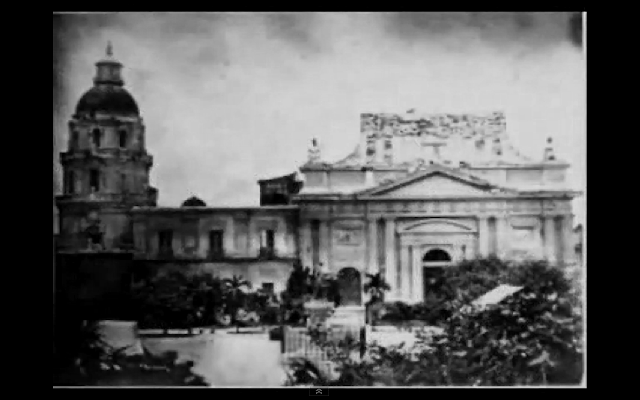 Thanks for sharing this post, the old photo of Manila Cathedral before the earthquake was so beautiful. I really love it!